Teresa Tanzi, candidate for State Representative in District 34 including Galilee, applauds the Rhode Island Congressional delegation for signing on to the recent letter to Secretary Locke at the Department of Commerce. The concern of this letter was the May 1 implementation of catch-share sector management, arguably the biggest change to the New England fishing industry in generations. The letter touches on the great sense of uncertainty that exists within the Port of Galilee and throughout our community. Tanzi joins our U.S. Senators and Representatives in urging the Secretary to consider the impact of implementation on the families and the community as a whole, and recommend that he increase the Total Allowable Catch (TAC) quotas for specific species to a level that is sustainable for both the industry and the fish. This cooperation is urgently needed in the midst of an unprecedented economic downturn, and especially in the wake of recent flooding in South County. This step will significantly aid in the transition to sectors by giving boats a more reasonable "share" of the resource. Tanzi is a consensus builder who has met with the DEM and the fishermen in search of middle ground, and will continue her advocacy at the state level when elected. As a Chamber of Commerce member and appointee to the South Kingstown Economic Development Committee, she understands the impact not only on the fleet, but on the surrounding businesses. “Without the boats going out, the fuel suppliers and ice plants, net makers and grocers, are losing income, too. The collateral damage is community-wide. The social and economic shortsightedness of the Commerce Department in its implementation of Amendment 16 will impact all of the surrounding businesses, big and small," says Tanzi. 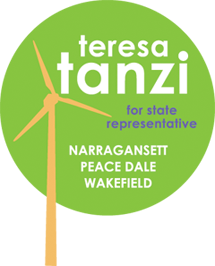 For more information on the Tanzi campaign, please call at 401.527.9468, email info@teresatanzi.com, or visit www.teresatanzi.com.